Enjoy your delicious cup of coffee served on this classic wooden coffee table as you swipe through your phone or read the newspaper. You will love our reclaimed grey finishing that superbly emphasizes the fine grain solid mango wood table top. A keen, handcrafted design ensures each piece is uniquely made. Experience the elegance of the Queen Anne style, cabriole legs that boast a shiny, durable chrome finish. Explore your taste in modern furniture by blending this fancy contemporary coffee table into your living room dicor. 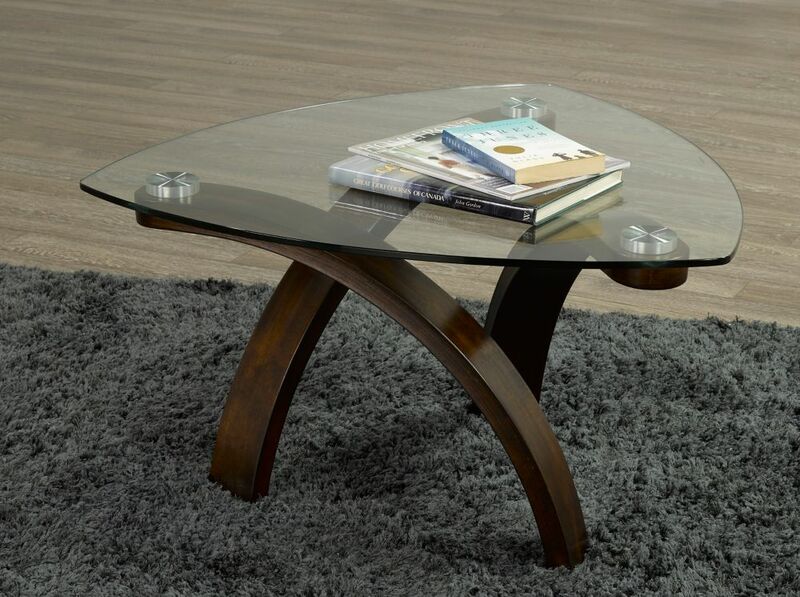 Teagan Coffee Table, Dark Cherry Meticulously crafted with tempered glass and espresso wood finish, this coffee table enhances your modern living space. The triangular glass tabletop contrasts beautifully with the arching legs, which provide a solid base for your entertaining and living needs. Pair this with its matching end and sofa tables to complete the look!